Profiles from the Archives: John N. Hackney Sr.
John Needham Hackney Sr. was born on April 30, 1894, in Wilson, N.C., to George and Elizabeth Acra Daughbridge (who went by “Bessie”) Hackney. The Hackney family had been operating for a long period in the 1800s a carriage manufacturing business with various partners in Rocky Mount and Wilson, N.C. George Hackney’s oldest brother Willis N. Hackney ran the company in Wilson, but he died on December 6, 1886. George Hackney and his brother Willis D. took over the company W. N. Hackney and Son, reorganizing and naming it Hackney Brothers shortly thereafter. By 1900, the Hackney family was living in Wilson. John N. Hackney attended and graduated from high school in Wilson. In 1912, John Hackney began attending college at North Carolina State College of Agriculture and Engineering (present-day North Carolina State University) in Raleigh, N.C.. He stayed for three years, and studied German for three years and French for two years. He was a member of the North Carolina State College 1913 baseball team. Hackney was forced to leave college during his senior year because he had contracted typhoid fever. He returned home to Wilson, N.C., and became the assistant manager of his father’s carriage and wagon factory. By the time of his federal draft registration for World War I, John Hackney had enlisted U.S. Army Officers’ Reserve Corps (ORC). He attended the Reserve Officers’ Training Corps (ROTC) training camp at Fort Oglethorpe, Georgia, from May 15 to August 14, 1917. Hackney was stationed at Camp Warden McLean within Fort Oglethorpe, where he served in Company 13, 6th Provisional Training Regiment. On August 15, 1917, he was honorably discharged from the Army’s in order to accept a commission as a 2nd Lieutenant in the regular Army for WWI service. John Hackney was assigned to duty at Camp Jackson, S.C., with Company B, 323rd Infantry, 81st Division, U.S. Army. He would move to Camp Sevier, S.C., with his unit later on. Hackney was promoted to the rank of 1st Lieutenant in February 1918. His unit moved to Camp Upton, New York, prior to heading overseas. 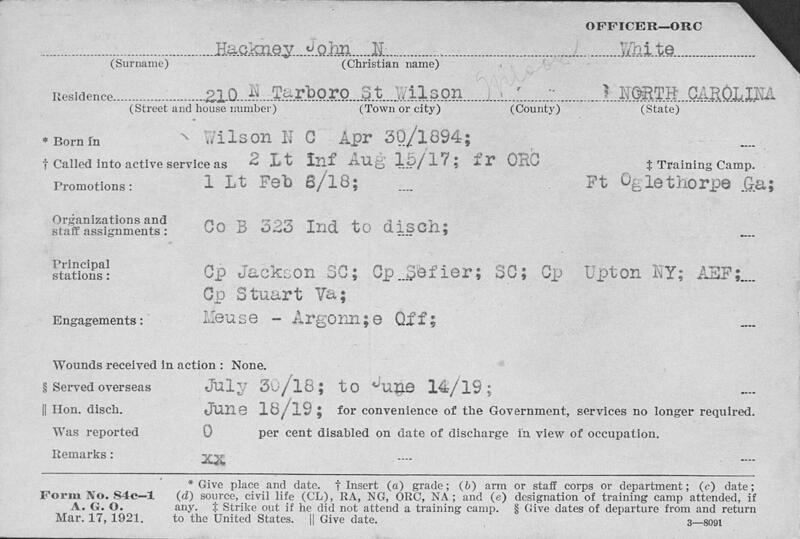 On July 30, 1918, Hackney and his men left from the United States aboard a military troop transport ship for Europe. Hackney would be involved in the following major campaigns in France and Belgium: Vosges Front from September 28 to October 18, 1918, and the Meuse-Argonne Offensive from November 7 to November 11, 1918. Later in the war period, Hackney’s unit partook in the military inspection and review of the 81st Division by U.S. Maj. Gen. John J. Pershing at Chatillon-sur-Seine, France, on April 10, 1919. After spending an extended period in service with the U.S. Army of Occupation in Europe, Hackney left from France and arrived in the United States on June 14, 1919. He arrived at the embarkation camp of Camp Stuart in Newport News, Virginia, off the troop transport ship. Hackney was sent to Camp Lee, Virginia, and was honorably discharged from active military service on June 18, 1919. After the war, John Hackney returned to live with his parents in Wilson, N.C., and appears to have started working as a manager of an automobile garage there. Hackney married Mary Henter on November 16, 1921, in Wilson. By 1925, John had become the secretary-treasurer of Hackney Brothers Inc., an automobile body builders’ company. The Hackney family had several other businesses in Wilson in the 1920s. Hackney Brothers Inc. expanded its product line to include ambulances, house trailers, hearses, portable storage rooms, temporary bleachers, car-top sleepers, and school buses as the century proceeded through new automobile technology. The company would patent the first carbon dioxide-based refrigeration system in 1931, and began a profitable specialization in refrigerated cars and carts. Milk trucks became its most important product. By early 1930, he had become the vice-president of the automobile body company. In 1930, John Hackney switched to being an insurance agent, and by the 1940s was operating the John N. Hackney Insurance and Reality Agency, which he continued to operate until 1966 at his downtown location on West Nash Street in Wilson. During World War II. John Hackney was the chairman of the Wilson County USO Committee. John N. Hackney Sr. died on March 20, 1979, in Wilson, N.C., and was buried in Maplewood Cemetery in the same city. You can now view the Hackney’s original WWI Army field notebook online through the digital WWI collection of the North Carolina Digital Collections, a joint effort of the State Library of North Carolina and the State Archives of North Carolina. Hackney’s field notebook contains military training notes written while he was in various training camps and during various training courses. The notes discuss infantry line procedures and movements, Army code writing, camouflage, writing map references, artillery, telegraph operations, mine warfare, and numerous other pieces of information. The information was also gathered in field training courses in France in the summer of 1918 from various military officers. 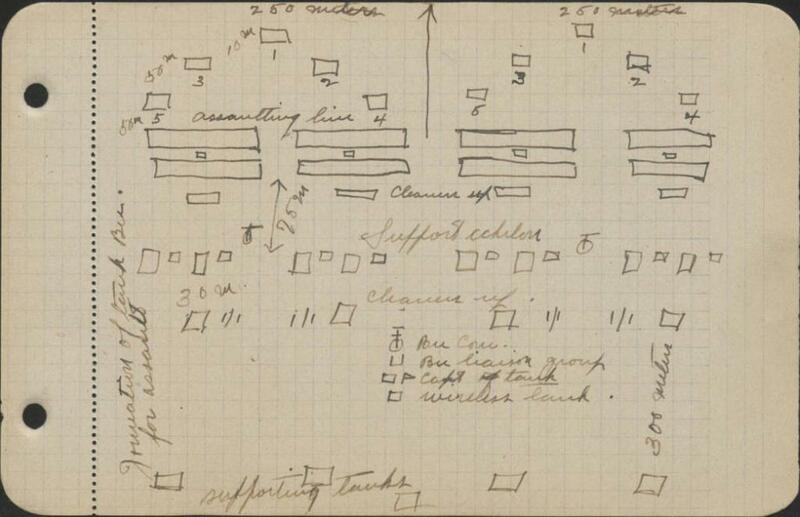 The notebook includes Hackney’s original drawings of field maneuvers and line operations. To learn more about John Hackney’s WWI service, check out the John N. Hackney Sr. Papers (WWI 106) held in the WWI Papers of the Military Collection at the State Archives of North Carolina in Raleigh, N.C.